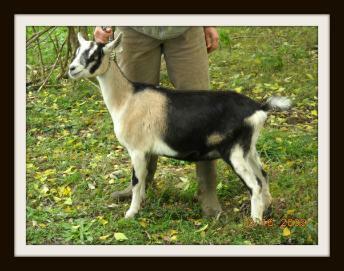 MAMM-KEY GENT'S TRUEBLOOD *B AA1458526 ( 4-06-2008 - 2-23-2012.) 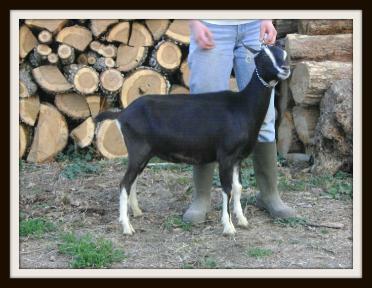 Trueblood is sired by CHERRY GLEN PASSWORD GENTRY *B AA1414364. 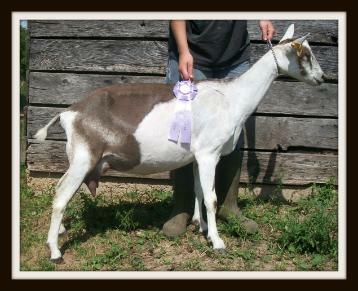 Pictured above is AA1370064,MAMM-KEY COZY'S CUDDLES, dam of Trueblood. MAMM-KEY SLIPPER'S COZY AA1253120, maternal grandam of Trueblood. 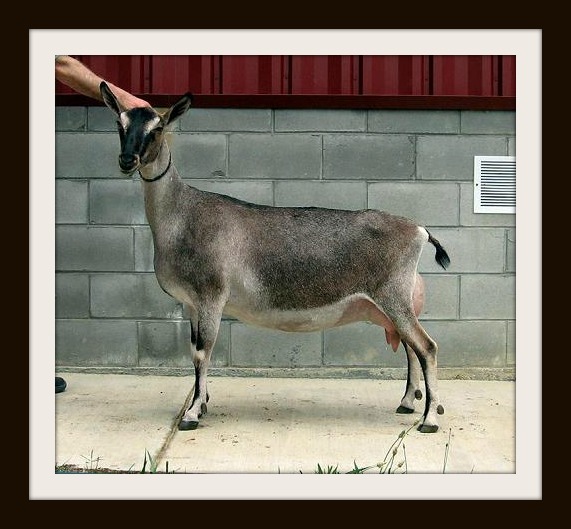 MAMM-KEY SEDONA'S BOGY sired many quality does and is the sire of Te-Iltcohe Bovery's Terror. 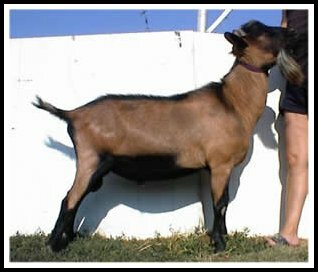 Sadly when we dispersed most of our herd in 2010 most of our Bogy daughters were sold. We have only one daughter remaining in the herd and she is an outstanding milk doe with a beautiful wide, high, and tight udder. 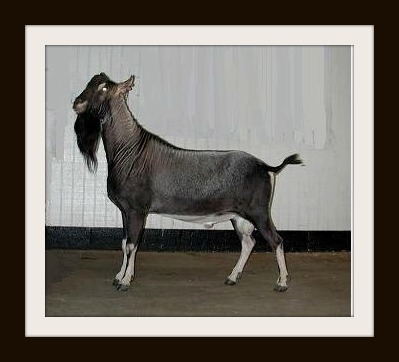 Bogy's dam SGCH Mamm-Key Amie's Sedona. 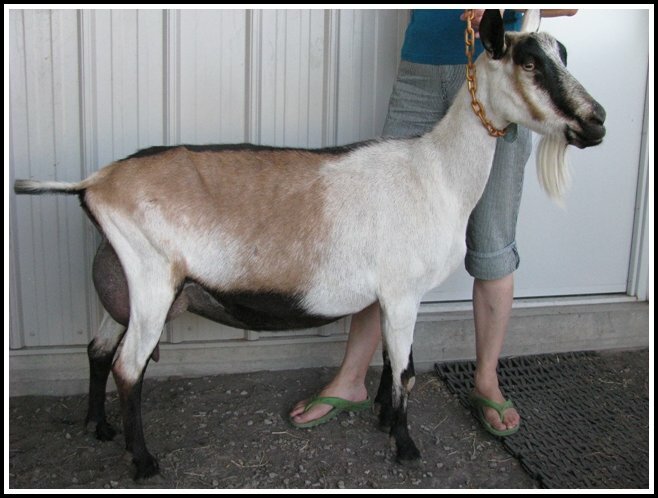 "Glamour" one of the many Bogy daughters sold in 2010. 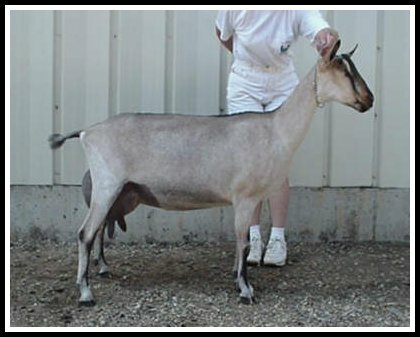 BRIGHT & BEAUTIFUL PH RENEGADE was a powerfully built French Alpine buck and was one of two of our foundation herd sires. 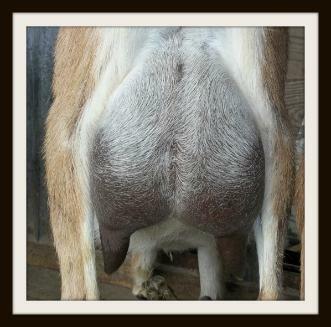 He contributed strength with plenty of dairy character to our breeding program. He corrected deep udders and attachment in his daughters. Milking Renegade daughters in our herd. 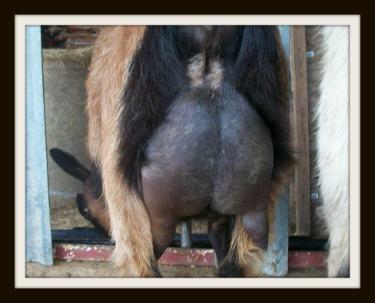 HERBAL MAID TATE CHARLEMAGNE sired tall, deep bodied daughters with correct udders and plenty of milk. Above and below are pictures of some typical Charlemagne daughters. Pictured above is the second freshening rear udder of Te-Iltcohe Solar Eclips A1583473, typical of our milking Charlemagne daughters. 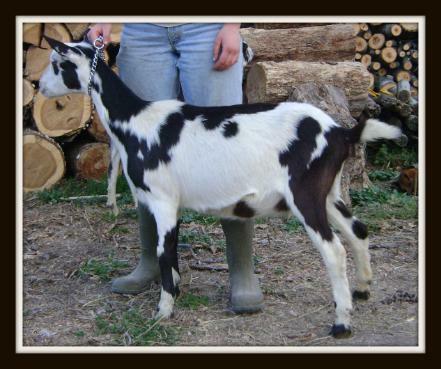 BRIGHT & BEAUTIFUL RAZZMATAZZ brought color and stature with lots of dairy character to our breeding program. 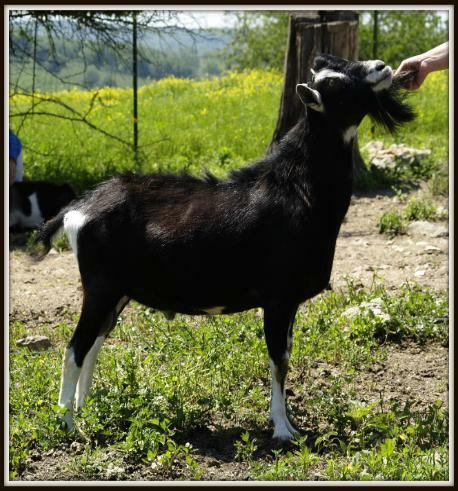 "Aioli" is a beautiful example of a pied daughter of Razz. She was sold in 2010 when we dispersed most of our herd. TE-ILTCOHE BOVERY'S TERROR AA1492176 is the son of MAMM-KEY SEDONA'S BOGY AA1285641 and SARAH B'S DISCOVERY AA1358514. Born 2-24-2008. Terror is siring daughters with strength, beauty and a will to milk. For Sale: $300.00. 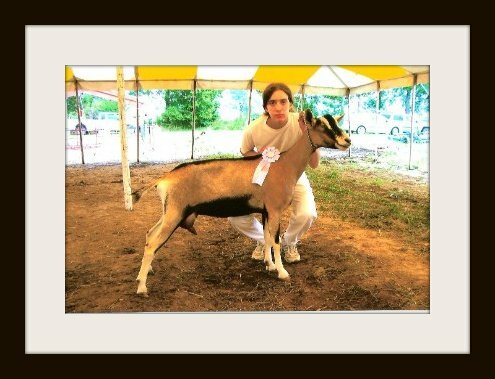 Pictured above is Sarah B's Discovery AA1358514 and our son Nathaniel at the 2007 Wright County Junior Show where she won Grand Champion Alpine for our son. 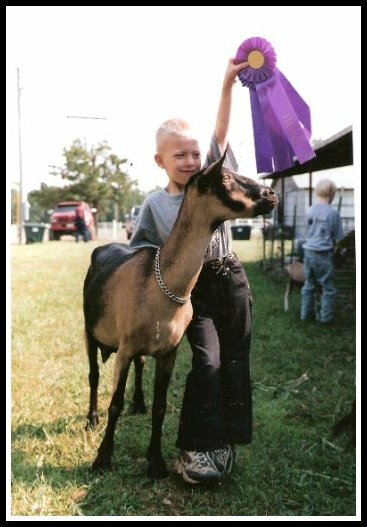 She also won Grand Champion Alpine for Nate at the Webster County Fair that same summer. Terror's paternal grandsire MAMM-KEY GYPSY'S CHAOS *B AA1195341. SGHC MAMM-KEY AMIE'S SEDONA AA1018969 is the paternal grandam of Terror. 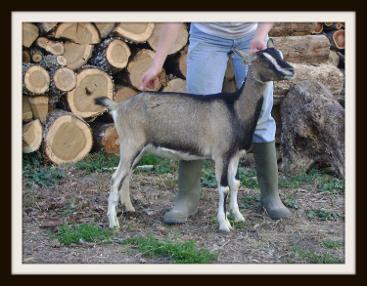 Terror's maternal grandsire SG BAYVIEW ULTIMATE WARRIOR A1190806. MAMM-KEY TAPESTRY GALADRIEL AA1116090, maternal great grandam of Terror. 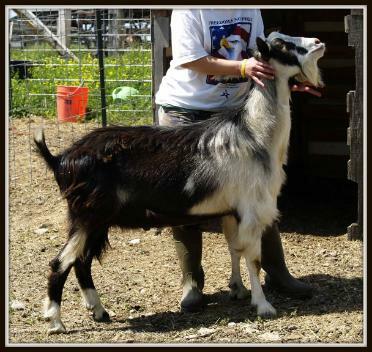 TE-ILTCOHE MIRAGE EL SIROCCO sired only a few daughters before we lost him. However, he sired pieds and other colors as well as very milky and beautifully uddered does. 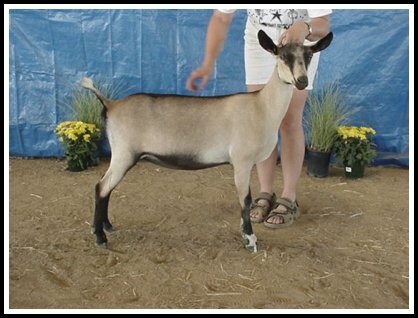 An eye catching example of a pied doe kid sired by Sirocco." Piper" is owned by Haley Landis of Missouri. 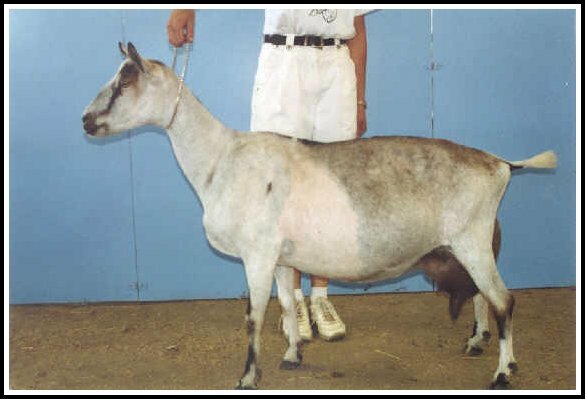 Pictured above is the udder of "Wee Lass" as a yearling in milk. She is one of only a few daughters sired by Sirocco. 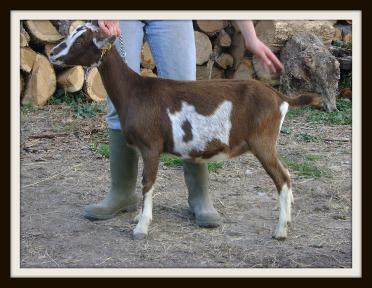 Petite and delicately formed this little French Alpine doe milks her heart out. NODAWAY CROT SNARFI, paternal great grandam of Sirocco shown here as a 4 year old. Thank you to Richard and Rica Waldman for kindly sharing pictures of Snarfi and Tempting Fate for me to use. THE LAREDO'S SHADOW was one of our two foundation sires along with Renegade. TE-ILTCOHE SHANET YANG was a favorite of mine. His dam SARAH B'S NETSACH, one of our foundation does, peaked at 3 gallons/day as a three year old. She is still in the herd today and as a nine year old senior doe milking over one gallon/day. 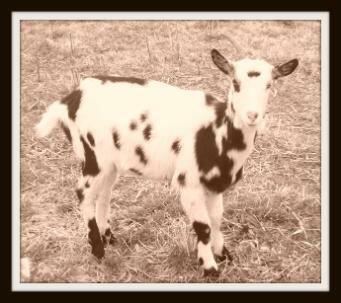 Above is a picture of "Yang's" full brother SARAH B'S GILES who we sold as a herd to a dairy in Indiana as a yearling. SARAH B'S NETSACH Above is a picture of " Yang's" dam in her working clothes as a three year old doe. 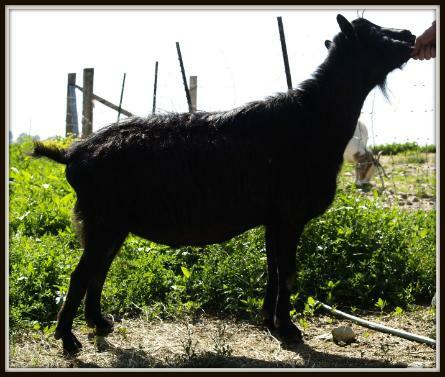 During her three year old lactation she peaked at 3 gallons/day. 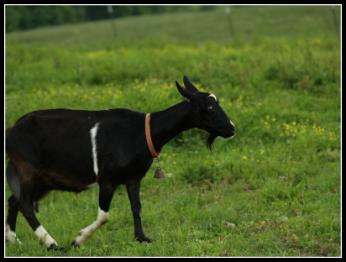 She is still in our herd at age nine and milking over a gallon/day. 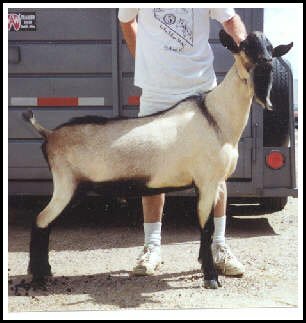 Unfortunately we never got any pictures of Yang before he passed and most of his daughters were sent to Texas when we dispersed our commercial herd. I would like to thank Tina and Duane Antes for making it possible for us to have included such fine genetics in our breeding program by selling Trueblood to us. 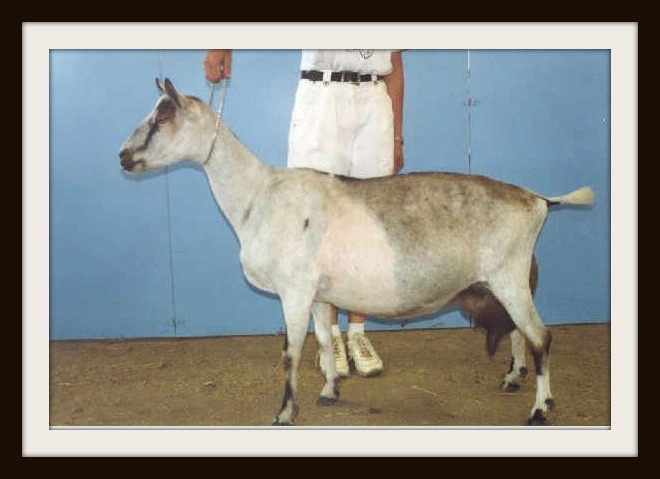 Also I very much appreciate their graciousness in allowing me to use photos from their web site to show the quality of breeding behind several of our bucks. http://www.mammkey.com . A big thanks to the Bunners of Sarah B's Alpines for the use of photographs of their animals featured in Apparition's information. 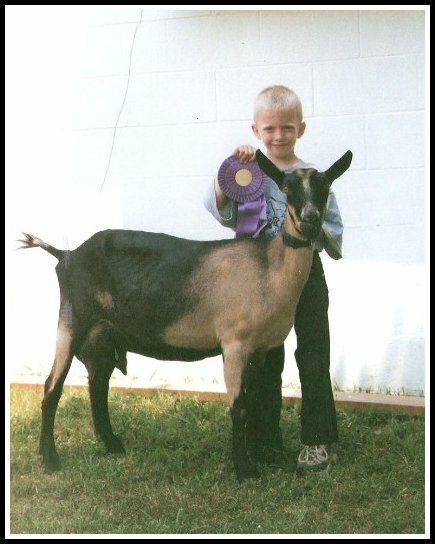 http://www.shepherdsgate.net/ .